Welcome to the internet home of Silver Doctor Fly Fishing, Wisconsin's most experienced guide service, specializing in Driftless Area spring creek trout and speycasting for autumn steelhead and salmon in the tributaries of the Great Lakes. 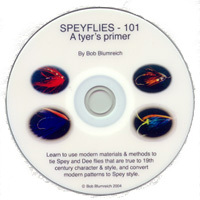 This site is dedicated to the Midwestern fly fisher and the fly tiers of the world. Whether your love is the intimacy of a limestone creek, swinging spey flies through a tumbling steelhead river, or tying the "perfect" fly, I hope you find something useful and entertaining in these pages. 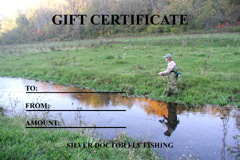 Silver Doctor Fly Fishing supports The West Fork Sports Club, The Federation of Fly Fishers, and Trout Unlimited in their efforts to enhance and protect our waterways and fisheries. By joining your local chapter, you will help preserve fishing for future generations. The GUIDED FISHING pages include: tackle recommendations, a hatch chart, live weather links, places to stay and eat, and will help everyone, even those who don't wish to book a guide, plan a trip to Wisconsin's Driftless Region or prime steelhead/salmon rivers. I'm happy to announce that I have joined the R L Winston Rod Company Pro Staff. I am also associated with AirFlo, & Galvan. This site will be updated as conditions & hatches change during the fishing season. Suggestions & constructive criticism are always welcome. The runoff is done, & the creeks are in excellentcondition. #18 black caddis & #16 tan caddis are active. BWO's drift & hatch under cloud cover. Full day bookings are available. REMEMBER: Your 2018 license & stamps expired at midnight on 3/31.